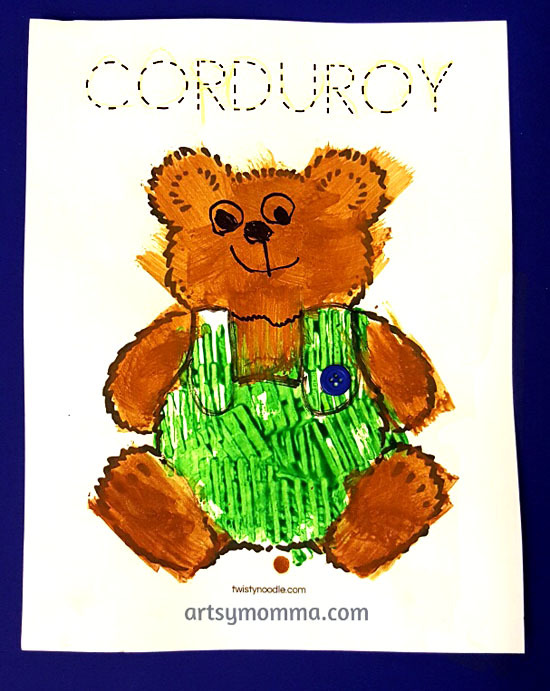 Home » Corduroy Crafts and Activities – Cute Teddy Bear Theme! Did you grow up with the book Corduroy? It’s such a sweet book and bring back memories from my childhood. This month’s book-inspired theme is teddy bears. They’re so cute and cuddly! They even have several holidays based around them. November 14th is National Teddy Bear Day, September 9th Teddy Bear Day, and July 10th is Teddy Bear’s Picnic Day. 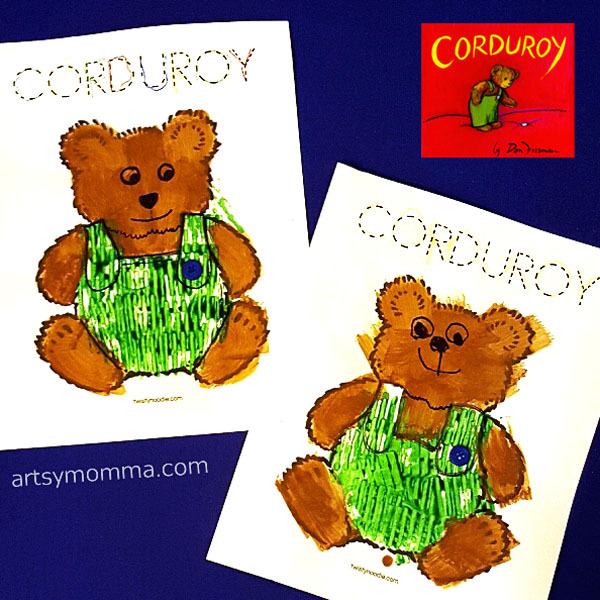 In honor of these much loved toys, we are sharing Corduroy crafts and activities. Incase you don’t remember the story of Corduroy, his adventure through the store, his button, and the little girl who uses her piggy bank savings to purchase him – you can check out YouTube for a video read aloud or see if your local library carries it. Print the teddy bear outline. This particular website lets you customize it with words. 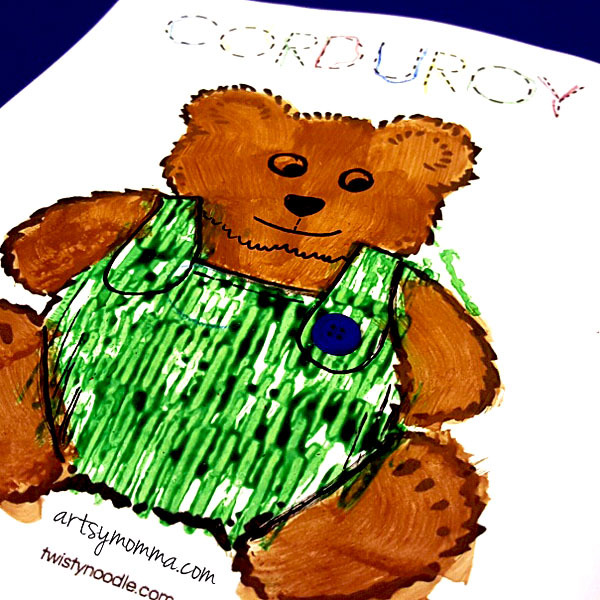 We chose to have it say CORDUROY with the dashed lines option. This was Little Sister could practice writing. Use the black marker to make an outline for the overalls (draw a line separating the feet and arms, and the top part of the overalls). Dip the block from the clay play set that has the lines on it. Make prints on the overalls with green paint while holding it with the lines in a vertical position. I explained to my daughter what corduroy was and showed her a pair of pants so she could feel it and see the vertical lines. Ideas to try if you don’t have the clay set: make fork prints, make a clay stamp or a styrofoam stamp. Paint the teddy bear using brown paint. We used a foam brush because it’s soft, just like teddy bears! Let dry. Once dry, use a black marker to make the straps on Corduroy’s overalls and the bottom of his face. Draw eyes, a nose, and a mouth. Glue a button to one of the straps. 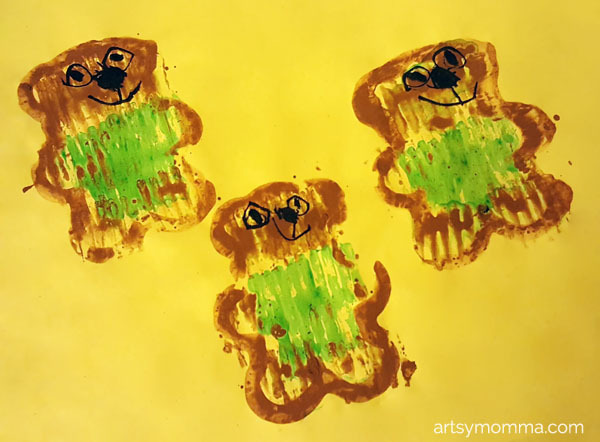 Stamp a teddy bear cookie cutter in brown paint and stamp on a sheet of paper. We placed brown paint on a paper plate, slightly watered down. Repeat a few times in different areas of the paper. Use the block with lines to paint the overalls. 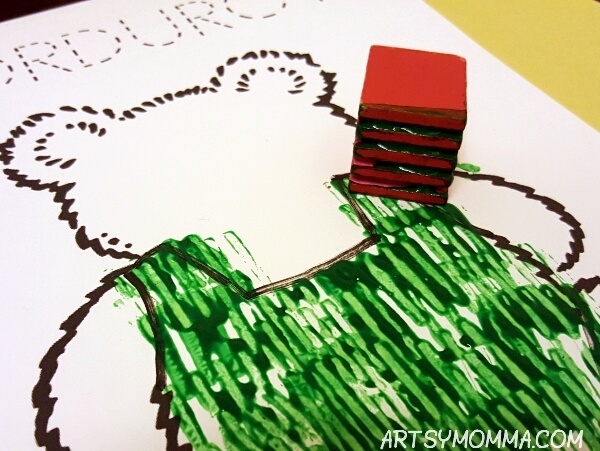 Clean off the green and then use brown to paint the teddy bear using the block. Once dry, draw on faces with a black marker. 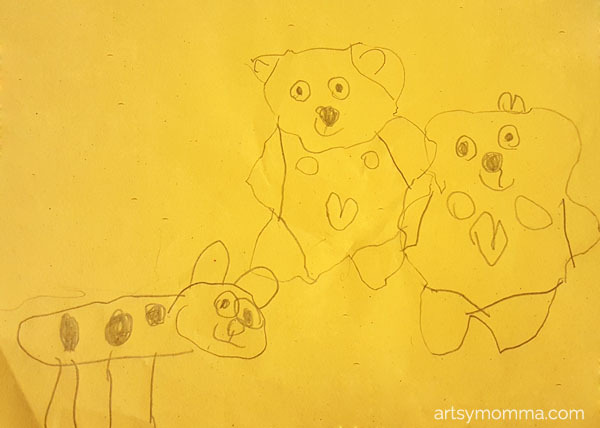 Little Sister also used the cookie cutter to make a teddy bear outline and then drew on details – too cute! Our last book theme for this year is snow and/or snowman! Incase you missed it, last month’s theme was spiders. What fun corduroy crafts and activities would you pair with this classic book?